Teen Girls Flip The Negative Script On Social Media : All Tech Considered Teen girls experience a lot of hate online. While parents and teachers try to address these problems from outside girl culture, teens have been coming up with their own social media solutions. 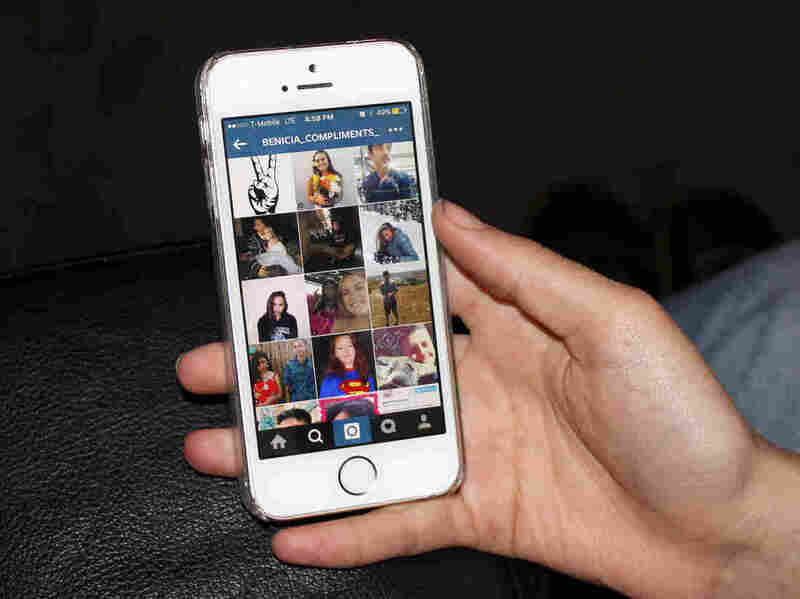 The Benicia Compliments page sprang up on Instagram as a platform for girls attending Benicia High School to tag each other in positive social media posts. For many teen girls, the Internet can be a hateful place. To counter the negativity, they've been coming up with their own social media solutions. According to Pew, 73 percent of teen girls use social media to get support from peers, so they've been creating spaces where teens play into the positive and taking national conversations about gender into their own hands. Last year, Caitlyn Clark, 16, who lives near San Francisco, saw an anonymous Instagram hate page about some girls she knows. "It's one of those things that just kind of appears like randomly, just out of nowhere. Someone will get tagged in a picture of themselves and the caption is just something really horrible," she says. Sara is a great person with a loving personality. I agree. Sara is so cute and nice. Can we have more people like you on this planet? There's also the trend of the "challenge" on social media. Usually, it's something like, "How many mouthfuls of cinnamon can you swallow?" Increasingly, there are challenges designed to spread self-esteem, kind of like a modern-day chain letter. On Facebook, for example, users are called on to post three confident selfies and to tag 10 people you feel should share their beauty with the world. "And then, there will be like 10 people [commenting] 'Awww, oh my God, you're so beautiful,' " says 18-year-old Billy Cruz, Caitlyn's boyfriend. "It's really cool, because it's like, here, I'm being confident, and then you guys all be confident now. And they're like, 'OK, we're all confident now, let's pass it on to other people!' "
I've been tagged in stuff like this before. And I was like, OK, whatever, next! Is confidence really as simple as getting tagged in a post? But when you dig beneath the superficial stuff in these social media campaigns, girls are raising serious issues. Take #dresscode, which challenges whether school dress code policies are fair. "When you interrupt a girl's school day to send her home because her shoulders are exposed, you're telling her that making sure that boys have a distraction-free learning environment is more important than her education," says Bay Area student Rhea Park, 15. She's reading from a thread on Twitter where girls post outfits they've been sent home for — like a T-shirt that shows her collarbone. Teenagers have been fighting dress code policies forever. But students haven't always had social media to make the case. "If one person goes and talks to a school administrator, I feel like they'll blow it off, be like, 'Oh, it's just one kid complaining.' But once you get it on social media and it's public, then it kind of becomes more urgent, and the school might want to do something more about it," she says. For example, a Kentucky high school's dress code policy changed after a student's YouTube video about the policy got more than 300,000 views. Here's the thing: As a teen girl, there are all sorts of situations we can't control, like a mean comment on Instagram, or the embarrassing experience of getting sent home for wearing the wrong outfit. When we take our story to social media, sometimes we manage to turn shame into empowerment.